The Critical Angle: Batman's an atheist? Not so fast. – AiPT! The Critical Angle: Batman's an atheist? Not so fast. The entertainment press (and even some Christian outlets) raised holy hell last week when they decided that Bruce Wayne had come out as *gasp* an atheist! Heavens, anything but THAT! It was in reaction to a riveting story told by writer Tom King and artist Lee Weeks in Batman #53, in which Bruce finagles himself onto a jury for the trial of Mr. Freeze, so he can convince the other members that his personal god, the Batman, had erred in this case. Along the way there’s some talk about Bruce’s (understandable?) loss of faith, but is it really enough to call him an atheist? Bruce Wayne is clearly not an atheist. He’s met gods, for Pete’s sake. His Justice League teammate (and brief love interest), Wonder Woman, is descended from gods. One can assume Bruce never questioned the validity of her parents, since she hasn’t escorted him off this mortal coil herself. Of course, those types of gods have long been more like extremely powerful aliens in the comics universes, but hey, that’s kind of how they function in actual mythology, too. No given one has much influence over stuff not in their particular domain (except for a big cheese like Zeus, for example). But still. No, what people really mean when they ask if Batman’s become an atheist, is if he’s lost faith in a different bearded father figure, the capital “G” God of the Judeo-Christian tradition. Even in this case, though, it’s not a simple answer. Bruce claims he’s “put aside” his belief, but it’s not unusual for a religious person to have a “crisis of faith” when faced with extreme adversity. Followers of the Abrahamic religions are told their God is at once all-knowing, all-powerful and all-good. How, then, can he let tragedies occur, especially when the wicked inflict them on the righteous? It’s often called “the problem of evil,” and there really is no good answer for it. Theologians and philosophers struggle with it so much, there’s even a word — theodicy — for the practice of attempting to reconcile these ideas. Some say that free will is the easy out — God so blessed us with this gift, and if we don’t use it wisely, that’s on us. Others fall back on God working in “mysterious ways” we don’t understand, or pointing out that adversity breeds character. One would think an omnipotent God though, who could make people any way he wanted to, could design things so that wasn’t the case. So all Bruce has really done so far is come to grips with something a lot of people already accept, begrudgingly or otherwise. Just because he now knows God doesn’t tick all three boxes that we’d want him to, that doesn’t mean, necessarily, that Bruce Wayne doesn’t believe God exists. Bruce confides in his peers that he transferred his faith to the Batman, because that guy gets sh*t done. It’s a sensible stance for the world’s greatest detective — empirical evidence shows that God does not intervene in human affairs (not even if you pray for it). But that doesn’t mean there can’t be some vague, benevolent force permeating all of existence, without really guiding how things go. That’s what some Unitarian Universalists believe. They’re a group formed in the ’60s from the combination of two Christian splinter sects, though whether an individual identifies as Christian today is really up to them. Or maybe Bruce Wayne is a deist. Deists believe that a god of some sort did the heavy lifting of creating the universe, and then promptly peaced out to watch it all unfurl from the comfort of his sofa, never to meddle again. Deism was popular during the Enlightenment, and some people think many of the founding fathers of the United States might have been deists. What good such a philosophy does anyone isn’t exactly clear, but you can’t say Bruce isn’t a deist. There simply isn’t enough information in Batman #53 to know if he’s an atheist, or where on the spectrum of belief he falls. There are plenty of ways for a person to not believe in the all-encompassing “God,” and yet still believe in something. And none of this is relevant, which the entertainment press (and even some Christian outlets) would know if they’d bothered to actually read the f***ing book. 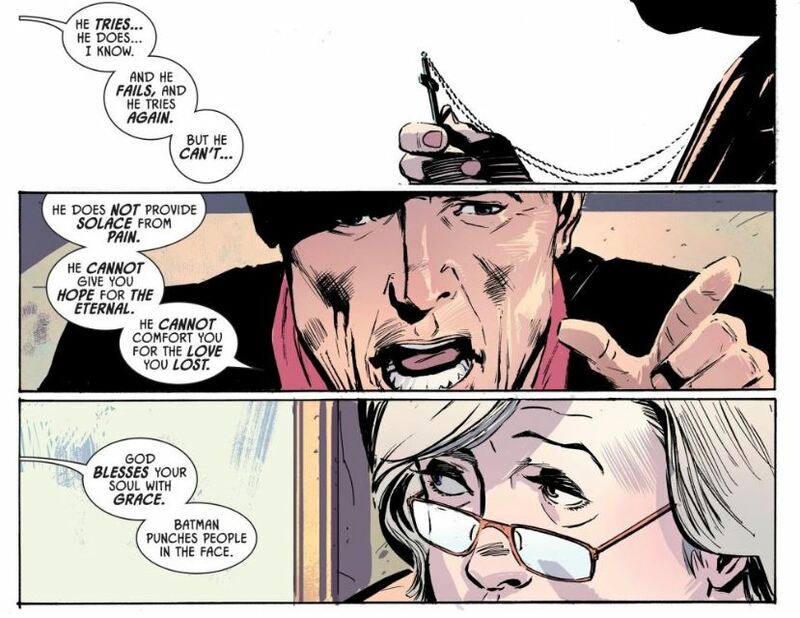 Bruce Wayne isn’t losing faith in God in Batman #53, he’s losing faith in the g**damn Batman. Which is evocative of Job’s journey, but obviously not equivalent to it. And just like in that story, and in so many other “crisis of faith” cases, you have to think Bruce will eventually come around and find his belief in Batman again. That’s what AiPT! Co-Editor-in-Chief Russ Whiting thinks, and the parallels are made pretty clear on the issue’s final page. The Critical Angle is a recurring feature that uses logic, critical thinking and sometimes math to analyze pop culture phenomena. Rather than repeating the same old claims, we put them to the test.